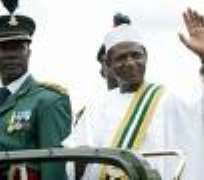 President Umaru Yar'Adua walked his talk on Tuesday, as he announced a cut in his own salary and allowances and those of other federal political office holders, in line with the global economic crunch. Aso Rock Spokesman, Olusegun Adeniyi, told reporters in Abuja that the initiative is to ensure that national development is not adversely affected by the downturn. Adeniyi - who spoke after Yar'Adua met with Ministers, Special Advisers, and Special Assistants at the Villa - said his boss has initiated action with government agencies to effect the decision. The 36 Governors who also met at the Villa under the aegis of the National Economic Council (NEC), chaired by Vice President Goodluck Jonathan, expressed support for the pay cut plan, and pledged to emulate it. Adeniyi recounted that Yar'Adua urged public officials to make personal sacrifices for the greater good of the nation, and asked them to exhibit much greater honesty, dedication, and commitment to selfless national service in the discharge of their responsibilities. "Yar'Adua said he expects public officials to put the interests of the nation first at all times and focus on providing real and effective leadership in their areas of assignment for the speedy attainment of the goals of the administration. "He noted that the current remunerations were untenable and unjustifiable in the present circumstances,''Adeniyi added. "Yar'Adua disclosed that he would be forwarding a letter to the Revenue Mobilisation Allocation and Fiscal Commission (RMAFC) to consider taking necessary action on the matter. "(He) said the current global economic crisis would also provide fresh opportunities for leaders at all levels to ensure that Nigeria's Vision 20:2020 is not derailed. "(And) that he has confidence in the capacity of Nigerians to seize the moment to reposition the country for peace and prosperity." At the moment, the President earns N3.51 million per year, Vice President (N3.03 million), Minister (N2.02 million), Minister of State (N1.95 million) and Special Adviser (N1.94 million), Governor (N2.22 million), Deputy Governor (N2.11 million), and Commissioners (N1.33 million).